Dave Miller considered himself a very lucky guy. He spent his life doing exactly what he wanted to do. He was a great son, husband, father, grandpa, athlete, English teacher, coach, mentor to kids, and friend. He never judged, never hated, never complained. He passed away after a long, hard battle with Parkinson’s disease. Dave was born in Helena on June 4, 1941 to Marie (Woods) and Jim Miller. He had a sister Pamela and a brother Ron, deceased. His grandpa, Paddy Woods, was a Helena realtor who shared with Dave his interest in keeping fit and exercising. Dave began weightlifting in his bedroom when he was 16, despite the teasing he received from high school friends. He was still trying to lift a medicine ball the day he died. He graduated from Helena High School in 1959 where he was on the football, basketball and track teams. He and his wife Marilyn (Brewer) were high school sweethearts and celebrated their 58th wedding anniversary this fall. He graduated from Carroll College in 1964 and moved Marilyn and his children Laurie and Nate to Malta, where his second son David was born. Dave jumped into teaching and wrestling with no experience but, with hard work and the help of great mentors, became proficient in both. 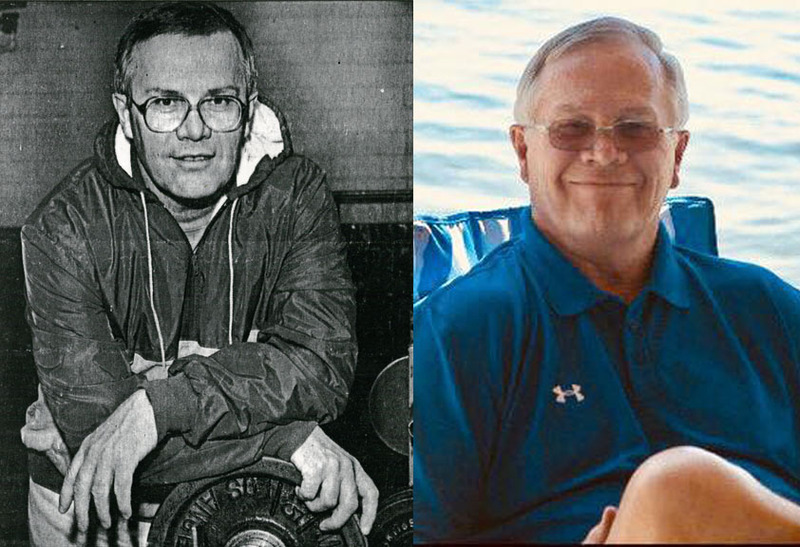 In 1969 he was hired to start a new wrestling program in Fort Benton, and in six years he built a very successful and competitive program. Along the way he had gained an addiction to the game of golf and for several summers ran the Signal Point golf course in Fort Benton. In 1975 Dave was offered the head wrestling job back at Helena High School, his dream job. He also taught English and had an opportunity to coach his own sons. He announced Helena High sporting activities and was a member of the Aim Higher team. In 2015 he was inducted into the Helena Sports Hall of Fame along with his son David. After retirement he spent his days golfing and following his grandchildren in their sports activities. Dave is survived by his wife Marilyn, his children Laurie Bakri and her husband Mohamed; Nate, and David and his wife Robin; grandchildren Nick, Derek, Reece, and Raef Miller, Jess Mosby and Shelby Pugh; great grandchildren Peyton, Harper and Kinley Mosby all of Helena. In lieu of flowers, Dave’s family has started a memorial fund to honor his legacy – please https://www.gofundme.com/d74zy-dave-miller-memorial-fund if you wish to donate. Dave began weightlifting as a teenager, well before lifting was cool and necessary to be a high-performing athlete. He loved time spent in the Helena High weight room. We would like to refurbish the HHS weight room in his name, so every Helena High athlete has a great place to follow Dave’s example. The family will receive friends, or “pre-game”, from 3:00 to 3:30 p.m. today, Sunday, November 4th at Anderson Stevenson Wilke Funeral Home, 3750 N. Montana Ave. in Helena. A vigil service will follow the pregame at 3:30 p.m. at the funeral home with a reception following in the social hall of the funeral home. A graveside service will be held at 1:00 p.m. on Monday, November 5th at Forestvale Cemetery in Helena. Please visit below to offer the family a condolence or to share a memory of Dave. I had the opportunity to coach and teach with Dave. What a great opportunity to work with this special man and friend. Of course his coaching and teaching success and influence was only overshadowed by his roles as a husband and father. He taught us all about hard work, loyalty and dedication while still being able to thoroughly enjoy what we were doing. I will miss you my friend. I had the great fortune of being one of Mr. Miller’s students at Helena High School. He was one of the influencers behind me becoming a teacher myself. Mr. Miller always pushed me and challenged me–he never let me settle for “average”, as he knew I was capable of much more. He instilled in me the value of work ethic, honesty, and hard work. I know he not only had an impact on me and my future, but the lives of many students, colleagues, friends, and family. He will be missed–my thoughts and prayers go out to all who knew him. I had the privilege of teaching with Dave at Helena High, and I thought how remarkable it was that he was always interested in growing as a person and teacher. I remember well the grant-funded experience we participated in, and this was my first real chance to get to know him. He participated with dedication and respect, and I was very impressed with how well he handled everything and what he learned and contributed to this experience. It was special because he was part of it! Though I haven’t seen him in a long time, I will miss him…his dedication, his work ethic, and his quiet and caring personality. Thanks, Dave, for being part of my life, and thanks to his family for sharing such a wonderful man! Mary Lou and I were saddened when we heard obout Dave. We have known Dave when we moved from Butte to Helena in the early 70s. I have had the privilege of watching Dave coach my son from small fry wrestling through his high school career. Dave his sons Nate and Dave were also teammates of me in the Bill Roberts golf league while I lived in Helena. I have always felt that one of life’s greatest treasures is the blessing of a real true friend. I consider myself both blessed and privileged to have had Dave as a friend for most of my 77 years. We met when we were 10 year old 5th graders at Bryant Grade School. We became friends, classmates, and teammates at Bryant and on to Helena High and Carroll College and throughout our lives. We fought side by side on the football fields, basketball courts, baseball diamonds and running tracks around Helena and the state. There we shared the many lessons and experiences of growing up and learning teamwork, sportsmanship, and working hard together to accomplish our common goals. He was a fierce competitor who always gave his best and was always ready to lend a helping hand to a teammate or friend who was struggling. His optimism and fighting spirit were an inspiration to all who knew him. These same traits made him a great father as witnessed by the wonderful family he and Marilyn have raised. I greatly admire the courage and tenacity he has shown in fighting off the ravages of Parkinson’s disease which he fought valiantly with the help of his beautiful family. We have lost one of our very best and he will be greatly missed but has left us with many warm memories in our hearts. Hugs and prayers to all of the Miller family and all who were blessed to know him. We are so sorry to hear of Mr. Miller’s passing. We have some great memories of Dave and the Miller family. We are thinking of Marilyn, Laurie, Nate, Dave and all the Miller family and sending you all prayers for peace. Sending love to the Miller family. I had the honor of having Dave as an English teacher at Helena High. He also announced at my basketball games. He was a class act in the classroom and in the school community. I am grateful for the time in my life I was able to know and learn from him. Dave and I were colleagues during the time that I taught at Helena High. While we didn’t actually team teach, Dave made certain that the literature he was teaching corresponded with the history I was teaching. This became important at the beginning of the year when his students were reading Hawthorne’s Scarlet Letter and I was teaching about the early colonial history leading up the Salem witch trials. He was truly an outstanding colleague. I am sorry that we didn’t get to meet again after we left Helena High, but please know that Dave was a class act at Helena High. It was an honor to teach with him. Coach Miller was a good man and leaves a great legacy. Many young athletes and students are much improved through his dedicated efforts. I am sorry for the family and community’s loss. So sorry and sad to hear about Dave. Having gone to high school with both Marilyn and Dave, we kept in touch all the time. Especially when I timed at track meets for years with the Miller starters. I thank Reece for keeping me informed of his grandpa’s condition. Gog Bless. It was with great sadness that I learned of Dave’s passing. He was truly one of the nicest people I have ever had the pleasure of knowing. I have many fond memories of when we were kids that I will always cherish. A cross word never passed between us.I extend my deepest sympathy to Marilyn and the entire family. It was a joy and pleasure to know and work with Dave during my time with the Helena School District. His commitment to and advocacy for his students made a difference in so many young lives. Dave gave generously of his time and energy, always willing to take on a new project or task that would benefit his students. He gave his all and inspired others to do the same. Thoughts of him bring his quick, warm smile immediately to mind. To Marilyn and all who loved him, I wish you healing, peace and comfort.